Who’s Coming Up on Monday, January 22? EKK Mondays off to a running start with Uncle George? In spite of the flu season reaching a record high, the mumps epidemic, natural disasters such as flooding, record cold weather and fires impacting the travel plans of our mainland neighbors, many “fortunates” found their way to the first night of EKK, an uplifting haven where they experienced an evening of Hawaiian music and stories, hula and ‘ukulele lessons, fellowship, food and fun with old and new friends. They were not disappointed at the first night of EKK. 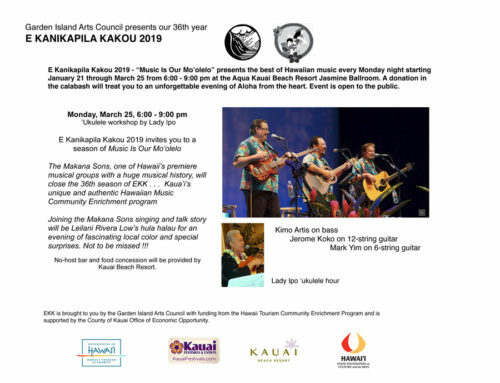 On the eve of his three-month tour, beginning on January 15 and ending on March 18, the exact same dates as EKK 2018, Uncle George Kahumoku, Jr. shared his musical legacy by introducing a few of his protégés in not only music but the art of living a life full of aloha. 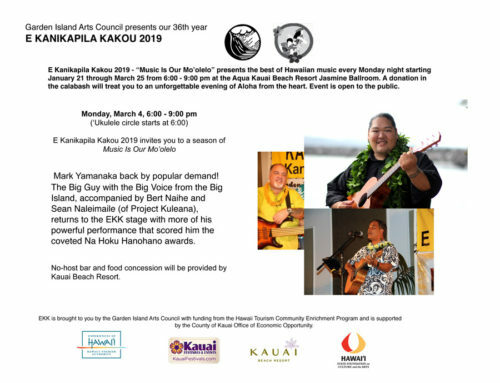 His mainland tour with Jeff Peterson and Ledward Kaapana, our next two EKK presenters, will share their fabulous artistry with audiences across the continent, but Kaua’i experiences it first at EKK’s 35th anniversary year. Besides his musical attributes, Uncle George, a life-long farmer raising every farm animal and every local crop, he adopts and fosters young talents and shows them how to play music, cook for large numbers, and farm on a huge scale through his week-long institute learning about Hawaiian culture and music with the finest instructors. He has been doing this for 21 years. 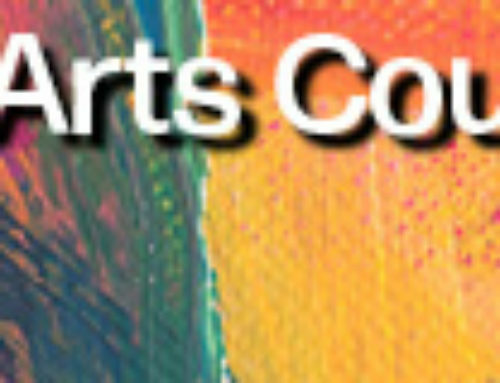 He also taught art for many years at Lahainaluna High School and after retirement started the “Institute of Hawaiian Music” at the Maui Community College. He is a force of nature when it comes to archiving Hawaiian music and musicians with the series of Hawaiian Music Legends DVD’s and promoting Hawaii’s finest artists in regular performances at the resorts in Lahaina and tours around the US Mainland. Appearing on the EKK stage for many years, George recalls that 20 years ago, the audience was so small that he had everyone sitting in a circle to play music together. Over the years, the EKK audience grew and has now exploded into a major event. “Music is our legacy” is this year’s theme so I asked him to share his legacy by introducing some of his protégés to us. Joining him on stage were Sterling Seaton, Max Angel Becerra, Wainani Kealoha and Charlie Naihe. So many bodies in the ballroom raised the temperature and wreaked havoc on the tuning of the instruments, but being the veteran performer, he tells stories while tuning, attributing his deafness to raising so many pigs for so many years. He said, “Hendricks says we tune because we care; Ledward says we tune because we are flat.” He thanked the sound team for making them sound good on stage. The gift of gab while tuning one’s instruments is something that is gained by years of experience on the stage. He had everyone join him on his chant by his mentor Aunty Edith Kanaka’ole; he followed this with a love song by Princess Likelike, Kuu’ipo I Ka He’e Pu’e One. Most of the songs and stories he shared were from his recent CD called Tutu’s Favorite Songs. When his grandpa died at an early age, his grandmother took over making the charcoal, so whenever she went up to the mountain, she had to have a “still” to make her ‘okolehao from ti leaves, hence, Tutu had her favorite drinking song, Koni Au I Ka Wai by King David Kalakaua. I remember this song well because the UH football players used to sing it all the time….koni au koni au….such catchy lyrics! The next song was the first Hawaiian song I learned while in college because my Wakaba Kai sorority sisters sang all the time. George shared that while living on Hawai’i Island, about 200 people sitting from the front porch all the way to the coffee fields would sing Makalapua. I can imagine how spiritual that must have felt. Wainani danced the hula to this wonderful old-time favorite. He finished his set singing my favorite Hawaiian song Hosana, one of Hawaii’s most revered spiritual song composed in 1877 by the Reverend Moses Keale of Waimea and Niihau. In his inimitable story-telling style where fact and fiction are embellished and intertwined for the sake of telling an unforgettable story, George recants the story of Moses Keale’s eventful climb to the pinnacles of Kalalau to hunt a goat. Struck by lightning, Moses was toppling 3,000 feet from the top of Kalalau to the Waimea river below and remembered the preacher’s sermon from the week before, “If you believe, you will be saved” and thus he was saved to compose the song Hosana, fathered a huge family of kids, all named Moses Keale, and built the Hawaiian churches in Waimea and Niihau. Uncle G’s story, full of embellishments, is always a riot but always great to hear. He then invited his first guest who attended one of his week-long music seminars on Maui. Formerly from Waimanalo and now living in Koloa, Charlie Naihe is the Hawaiian version of “John Wayne”, a strapping tall Hawaiian man who tips his hat in true cowboy fashion. He worked at the prison his whole adult life and grew up in Waimanalo where everyone who was anyone was playing music with the legendary Gabby Pahinui and other musical greats. Charlie sang about a bird catcher named Keoki and about the red and yellow birds that flew from branch to branch in the uplands of Koke’e. He sang it in an old style where the words just blended from one to another. When you watch him sing you feel transported back to the days when musicians from far and near sat in a circle in Gabby’s back yard… his style, his smile, the way his body swayed to the lyrics. Uncle George Kaleiohi’s song titled Anahola was sung in a very old style falsetto that is very rare to see these days; he seemed transported into another realm just by his own singing. We don’t see this old style of singing much anymore. To introduce his next guest, Uncle talked about his 20 years teaching at Lahainaluna high school. A student would have had to rack up over seven F’s and missed almost all his class attendance in order to qualify for admission into Uncle’s classes. To work with these students, Uncle George held a lot of jam sessions as part of his curriculum. Under these strict admission policies, Sterling Seaton did not qualify for the class, but he and his guitar used to hang around outside Uncle George’s class and took care of setting up the sound system for the jam sessions. In those days, he used to play classic rock but after he took George’s music seminar, he fell in love with slack key tuning, but confessed that he learned more about cooking and farming from Uncle instead of slack key because Uncle G is a farmer above all else. Turning 30 years old in two and a half weeks, Sterling has been with Uncle George for over 15 years. A gifted instrumentalist who likes making up riffs, Sterling played Ekahi, the first song he ever composed in slack key tuning. 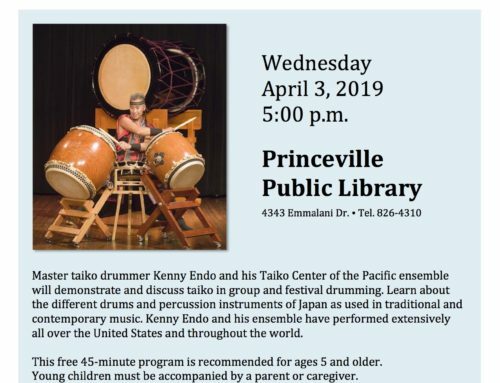 He never learned a whole song but likes to make up riffs; he then shared what he calls “The Pre-Show Show,” a collection of Hawaiian riffs which he strung together to use for sound checks. Sterling once made up a song during sound check that Bobby Ingano heard. Next time they met, Bobby Ingano, one of Hawaii’s top steel guitar artist, asked him for the song title. Sterling replied, “I don’t know; I just made it up.” Bobby asked Sterling to play that song with the “mynah” chord. So, whenever Bobby comes to Maui, they together play “The song with the Mynah Chord”, which is now the title of the song. Max Angel Becerra, turned 20 years old the day before when they were teaching the music workshop. At age 9 in fifth grade he entered the ‘ukulele contest at “Hula Girls” on Maui which was organized by Uncle George’s son, Keoki Kahumoku. He did not win that year. Finally, he won the contest when he was a freshman in high school and has ever since been a student and protégé of Uncle George, now attending the Institute of Hawaiian Music at the Maui college campus of the University of Hawai’i. Max has wonderful stage presence, knows how to play with his audience and is an awesome ‘ukulele player. He is gifted with a pure beautiful voice which he showed off by singing Olomana’s E Ku’u Home ‘O Kahalu’u medlied with White Sandy Beach made famous by Bruddah Iz. He called hula dancer Wainani Kealoha up to dance to Frank Kawaikapu’okalani Hewett’s Ka Wai Lehua A’ala Ka Honua. He sang an original song which he wrote while in drivers ed called the Drivers Ed Blues. To show the audience that the ‘ukulele works fine for the Kamoa ‘ukulele giveaway right after intermission, he played and sang a song that resonates with people the world over because of the person who made it famous; Max gave a fabulous rendition of Somewhere Over the Rainbow in the style of Bruddah Iz. After the intermission, many folks were lucky winners of CD’s by many of our favorite musicians; all they had to do was to fill out their registration form as participant of EKK and six lucky winners won their CD’s. One of the CD winners was also the extra lucky winner of the Kamoa ‘Ukulele; her name is Kris Murray from Canada (what in the world did she eat for breakfast?). Nancy Kahumoku also gave away CD’s and Uncle George’s wonderful book of his best stories titled A Hawaiian Life. George shared that initially he was planning to bring his famous music seminar for a weekend at the CCC Camp on Koke’e. From all reports of the weather at Koke’e this weekend, none of the participants could have played their instruments with frozen fingers. Not the best time of the year. Instead, we opted for a shorter intense version of the workshop at the Kauai Beach Resort on Sunday. All who attended had great comments about how wonderful the workshop was. 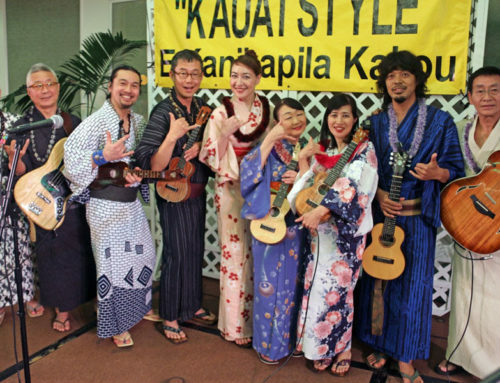 However, music enthusiasts should add Uncle George’s Maui Slack Key Guitar and Ukulele Workshop, a week-long seminar from June 17 – 24, to their bucket list. The last set of the evening featured all four on stage –Uncle George, Max, Sterling, Charlie — plus the hula by Wainani. E Pakika, a song discovered by Eddie Kamae on Kaua’i about the O’opu that swim downstream in the rivers to spawn and lay their eggs and swim back up the river was a real treat for the ‘ukulele circle. Just finding the lyrics to that song put us through hoops for days, even contacting Myrna Kamae who was busy at the Sony Open 18th hole. Luckily, George brought his copy of the song. What a treat for serious musicians to be able to learn this song; Uncle taught it to the ‘ukulele circle during the first hour of EKK. The song is so timely on Kaua’i where the west-side community is trying to figure out a way for the O’opu to be able to make it down to the ocean because the silt build-up in Waimea River close to the swinging bridge has introduced a major challenge for this cycle of life to continue for the O’opu who inhabit the Waimea River. Sterling, who loves messing around with riffs during sound checks, came up with a song that ended up on one of their Grammy winning CD’s; the lesson for Sterling was: Lesson #1 always listen to Uncle G; Lesson #2 always mess around during sound checks. Wainani taught Uncle Dennis’s Koke’e to the hula circle during the first hour; she was called up on stage to dance the hula sung by Charlie Naihe. Always a crowd pleaser no matter where it’s sung, Koke’e is a song that everyone can sing along. To hana hou Wainani’s hula, Max Angel sang another one of Frank Kawaikapu’okalani Hewett’s hula numbers titled La’ieikawai. It was a full plate evening with masterful Uncle George and his talented young protégés and a rare old style singing by Charles Naihe and the beautiful hula by Wainani. Uncle George sent out birthday wishes to some audience members — Julia, Jack and Sam — visitors celebrating their birthdays on Kaua’i. Of course, also to the very talented 20-year-old Max Angel. There is nothing quite as uplifting as the voices raised in song to Hawaii Aloha as everyone clasped hands in friendship and the sharing of a wonderful evening of Aloha.